Coles is bringing rockers Status Quo to Australia and will sell a new studio album from the British group exclusively through its stores featuring the ‘big red hands’ version of ‘Down Down’ used in its TV commercials. In a cunning turn of phrase, Coles announced that it’s behind “Status Quo heading down down under for a national tour” in March-April 2013. The supermarket giant has partnered with Chugg Entertainment to sponsor the tour, which will visit Sydney, Melbourne and Brisbane. Coles branding will appear at the events which are officially labelled as ‘proudly presented by Coles’. Over a career spanning 50 years, Status Quo has released more than 30 albums, selling 118 million records worldwide thanks to classics such as ‘Down Down’, ‘Whatever You Want’ and ‘Caroline’. 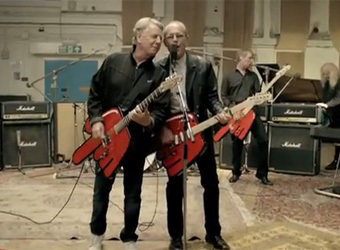 Their appearance in Coles’ ‘Down Down, Prices are Down’ TV ad had many questioning why such a successful band would potentially compromise its image by producing an altered version of one of its songs. The supermarket also released a TVC earlier in the year featuring Normie Rowe and Curtis Stone butchering Rowe’s rock hit ‘Shaking All Over’, drawing a social media backlash.